Sirens of Titan tells the story of the wide-ranging journey of Malachi Constant, the wealthiest man on Earth, from Earth to Mars to Mercury, back to Earth, and finally to Titan, a moon of Saturn. Along the way, Constant is seemingly manipulated and controlled by Winston Miles Rumfoord, an American aristocrat whose existence has been scattered across time and space after flying into a warped region of the solar system while on a space flight to Mars. 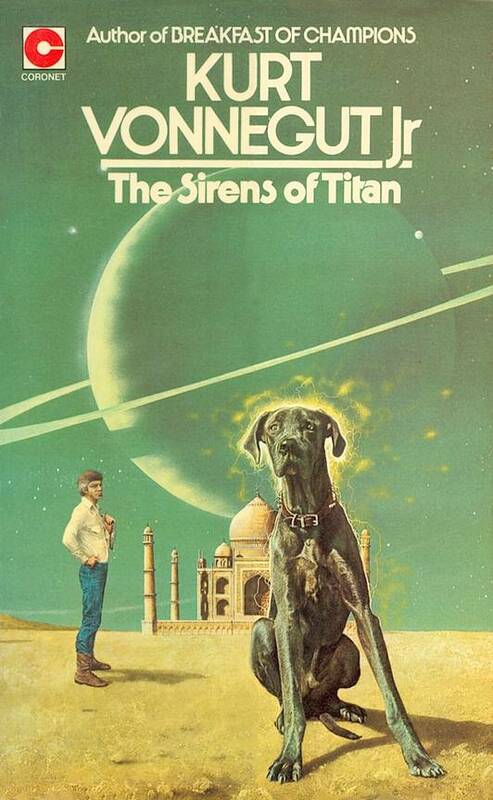 The Sirens of Titan is a Hugo Award-nominated novel by Kurt Vonnegut, Jr., first published in 1959. His second novel, it involves issues of free will, omniscience, and the overall purpose of human history. When Winston Niles Rumfoord flies his spaceship into a chrono-synclastic infundibulum he is converted into pure energy and only materializes when his waveforms intercept Earth or some other planet. As a result, he only gets home to Newport, Rhode Island, once every fifty-nine days and then only for an hour. But at least, as a consolation, he now knows everything that has ever happened and everything that ever will be. Surprise. Sirens of Titan is not pulp fiction. This book is an insightful examination of the human will, destiny, and religion. The main characters were taken through a wringer to fulfill a cosmic joke, sparing no one, not even the most powerful character. I, the reader, was taken through a roller-coaster ride from Earth to across the Solar System. The journey was physical, emotional and philosophical. The writing was rich, complex, unbelievably profound, and wildly imaginative. I felt very bad about the dog. Up to now I am thinking about the fate of the dog. I read this book some time ago so I cannot provide a detailed review. But even if I had read this just now I think I will still be unable to write a coherent one. There was just too much happening and being said in such a thin book. I remember being scared to answer many of the questions posed in the book. I remember having this question: Did the book belittle humanity or celebrate it? This new year, perhaps let us take time to reflect not just on the books we’ve read but also on our actions, habits and their consequences. Helpless or not, I think we still have responsibility. And that like the characters in Sirens of Titans we should never give up hope.